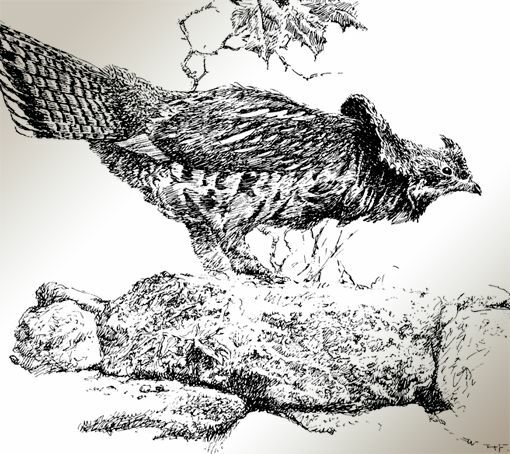 The Foster family asked Wild River Press to faithfully reproduce their grandfather’s 1942 first edition of New England Grouse Shooting in all graphic aspects, including original size, as exactly as possible with today’s materials. To achieve the excellence and authenticity we desired, we turned to experienced craftsmen at the largest American custom sheet-fed printing plant. It’s in Tennessee. This 75th Anniversary Edition features a carefully matched tan Brillianta cloth cover, 80# Royal Sundance felt warm white text stock, and endpapers of Mohawk jute fleck print. All are American-milled materials. We made one significant departure. In the original book, inside and across from the title page there is a color reproduction of the oil painting displayed on the front of the jacket. The author’s son, William H. Foster, Jr., posed for the picture. 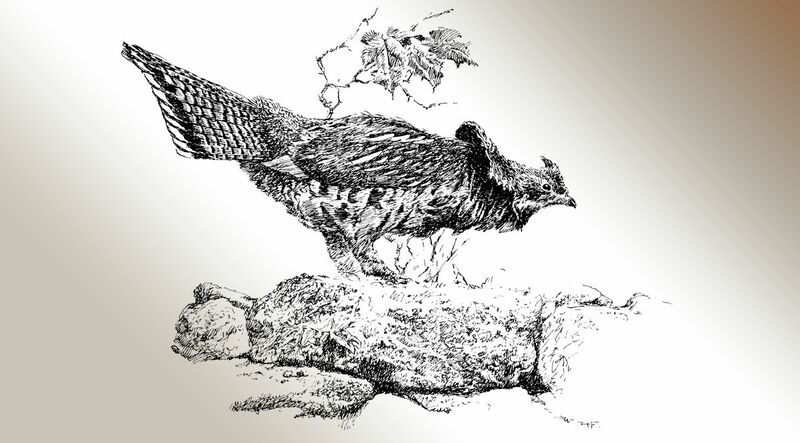 You will notice that he is shooting at a flushed grouse over a pointer dog. 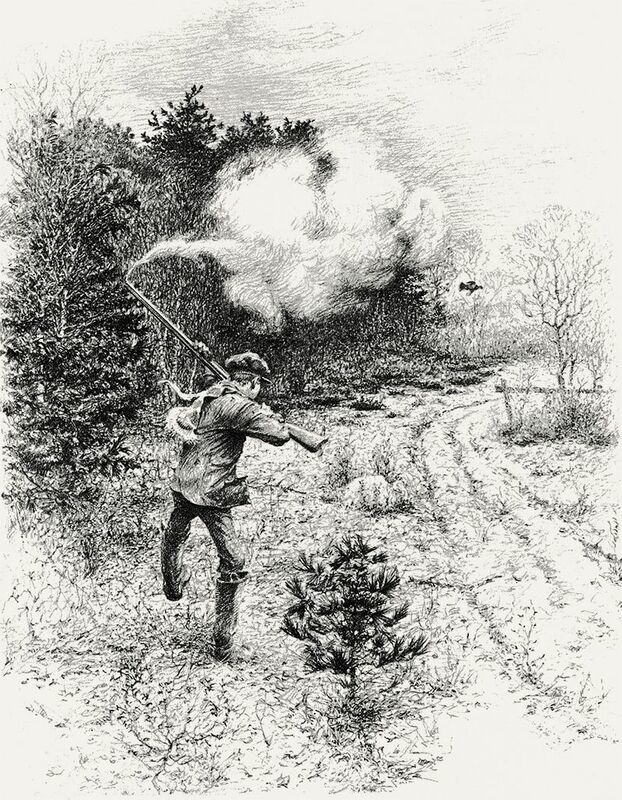 What few outside the Foster family know is that, as a prototype for the final oil, the artist did a smaller watercolor of the identical scene—except in the first version Bill Foster, Jr. is shooting over an English setter. We selected the unique watercolor for the frontispiece miniature of this new 75th Anniversary Edition. William Harnden Foster was born in Andover, Massachusetts in 1886. He was raised in the still-rural countryside among hardscrabble farmers, hunters and trappers. Wild game was abundant. Young William had a talent for drawing, and he began his higher education at the Museum of Fine Arts in Boston, where he studied for three years. He achieved greatness at the Howard Pyle School of Illustration Art in Delaware. Pyle was one of the foremost commercial illustrators of his era, famous for children’s books such as The Merry Adventures of Robin Hood. Foster’s contemporaries who also gained their polish from Pyle included N. C. Wyeth, Maxfield Parish, Harvey Dunn, Philip Goodwin and Frank Stick.